As a general rule, training sessions should not last more than 10 minutes once or twice a day. It's also very important that you are in a good mood and willing to praise your dog enthusiastically when it performs well. Never get frustrated with your dog or use harsh physical force to make it perform. If you begin to feel frustrated or angry, stop the sessions immediately. Your pet will never perform well if you can't remain calm and positive. And always end each training session with playtime so that your pet links its training to a favorite activity. Here are five easy tricks you can teach your dog. Put your dog in a "down" position. Then, put a treat in your hand and move your hand slowly behind your dog's neck. Your goal is to get your dog to turn its head backwards without standing up. Then, as its head reaches back to sniff the treat, gently roll it over. 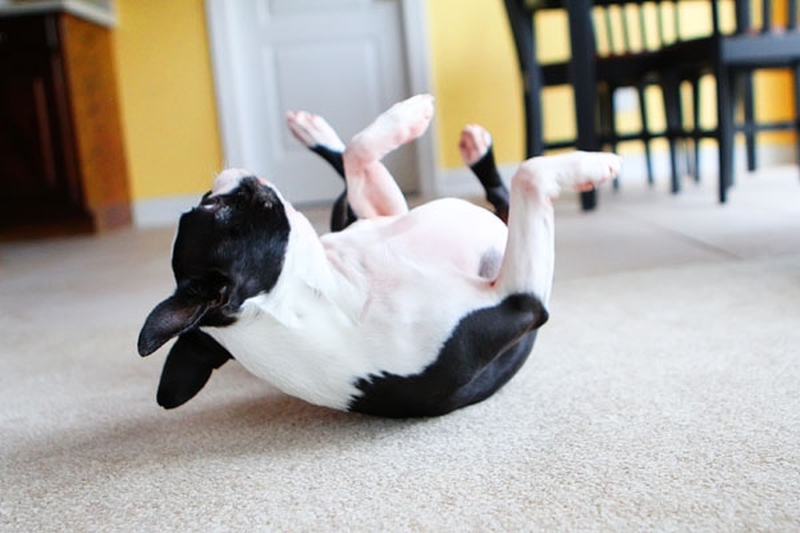 As soon as your dog rolls over, give it the treat and praise your dog enthusiastically. Repeat the process and as you start to roll it over, say the command "roll" and when it goes completely over, treat it and give praise again. Do this for five to 10 minutes. Try again later in the day for another five to 10 minute session. Eventually, your pet should understand that the command and the rolling process are directly linked. After your pet rolls over when asked, you no longer need to offer a treat each time. Always praise your dog when it performs correctly, and don't get frustrated if it doesn't seem to be catching on right away. Stop the session if you can't stay calm and relaxed. Teaching a dog to shake hands is generally pretty easy because some dogs naturally raise their paw when asking for a treat. Start by putting your dog in a "sit" position. Then, put a treat in your hand and slowly move it towards the ground near the dog's paw. Keep practicing and always use the same paw for training. Eventually, once the dog holds its paw up on command, you can switch to the other paw. The key here is to use another command such as "other" so the dog learns that one command works for its right paw and the other for its left. Once your dog is shaking hands on command, you can start to eliminate the treats and offer happy praise instead. As your dog masters the "shake" command, it's a simple matter to teach him to do a "high five." Start by working on the "shake" command, but begin to hold your palm out and as the dog hits your palm, give the command "high five." Treat and praise your dog immediately. Your goal here is to get the dog to raise its paw as high as possible and to touch your open palm. Encouraging your dog to bark on command is easy if your pet is naturally vocal, but it can take a bit longer to train if your dog is on the quiet side. Start by getting your dog excited by tossing a ball or talking in an excited tone. Then, put your dog in a "sit" position and wave a treat by your dog's nose. Keep waving the treat without letting your dog see it until your dog whines or cries. As soon as your dog makes a sound, reward your dog with the treat. Repeat the process, but use the command "speak" as your dog begins to make noise. Do not reward your dog until it makes noise. And, always tell your dog "hush" or "enough" and walk away when you want your dog to stop. Note: If your dog has a tendency to bark excessively, use this trick only when your dog is in a sitting position. Barking at everything that walks by your front window should not be encouraged and should never be rewarded with treats or praise. Although almost any dog can be taught to dance, the smaller breeds are typically easier to train. Getting a Saint Bernard up on its hind legs can be challenging, but lively dogs under 40 pounds can quickly learn to cut a rug. Start with your dog in a sitting position and hold a treat in your closed hand near its nose. Slowly lift your hand over and slightly behind the dog's head so the dog looks back and begins to stand on its hind legs. As soon as your dog stands on its hind legs, praise the dog and give it the treat. Repeat the process until your dog stands quickly and sturdily on its back legs. Then, begin moving the treat above the dog's head in a small circle. You want your dog to twirl on its hind legs. As soon as the dog begins to step in a circle, use the term "dance" and offer praise and the treat. Use the treat as bait to get the dog to stand up and turn in a circle. Again, this trick is easier to accomplish with small, agile dogs. Avoid this trick if you have a breed prone to back trouble such as a dachshund.